Brickhouse @D’Aguilar Street (Hong Kong, China) | Get Your Grub On! I was at ‘Brickhouse’ for the first time a few years back and this is where I had my first proper corn tortilla taco. As always when coming to Hong Kong my schedule – my food schedule in particular – was packed full so I requested for a second dinner here a few hours after the ‘Double Happiness Cafe‘ and when it became more likely to get a seat. 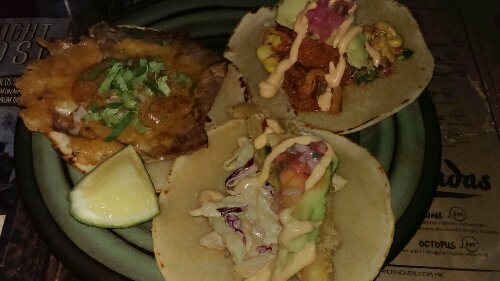 After starting up with some of their delicious ‘Diablas‘ (vodka, rasberry and jalapeno) I ordered a slap of three ‘Tacos‘ – beef, fish and pork. Startup was the ‘Ribeye Taco‘. They obviously make the corn tortillas themselves as they first had a more rustic look than their assembly line manufactured cousins and were also much thicker. Latter made them also slightly dry and starchy but I didn’t mind due to the fact how much effort they had put into making them. This one was layered with a couple of thin slices of lean steak and gratinated with some sharp tasting cheese, simply sprinkled with some cilantro and a dash of lemon. Not bad at all but quite cheesy. The fish was a bit dry which was partially resolved by the avocado, the chipotle like sauce and the coleslaw but I couldn’t help but remembering this one to have tasted better at my last visit. Lastly I attended to the ‘Pork Taco‘ with it’s nicely moist slow cooked meat and which used the same sauce and avocado topping as the fishy version. Great taste still. I still love this place for it’s great food, the amazing drink(s) and the bustling atmosphere so that we were lucky to get a table even at 11:00 p.m. at night. Maybe next time I’ll try to queue up with the crowd upon opening and finally get to taste some other dishes like the ‘Do-It-Yourself Bone Marrow Tacos‘ that unfortunately weren’t available til late. Muchas Gracias.